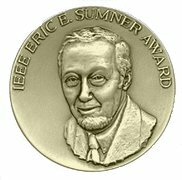 The IEEE Eric E. Sumner Award was established by the IEEE Board of Directors in 1995. It is named in honor of Eric E. Sumner, 1991 IEEE President, who retired as Vice President, Operations Planning, AT&T Bell Laboratories after a long and distinguished career. Recipient selection is administered by the Awards Board through its Technical Field Awards Council. This page was last edited on 22 April 2019, at 16:23.